Thanks to Robin Ess for the easy to read chart! Objective Cushing’s disease (CD) is a rare endocrine disorder characterized by excess secretion of ACTH due to a pituitary adenoma. Current treatment options are limited and may pose additional risks. A literature review was conducted to assess the holistic burden of CD. Design Studies published in English were evaluated to address questions regarding the epidemiology of CD, time to diagnosis, health-related quality of life (HRQoL), treatment outcomes, mortality, prevalence of comorbidities at diagnosis, and reversibility of comorbidities following the treatment. Methods A two-stage literature search was performed in Medline, EMBASE, and Science Citation Index, using keywords related to the epidemiology, treatment, and outcomes of CD: i) articles published from 2000 to 2012 were identified and ii) an additional hand search (all years) was conducted on the basis of bibliography of identified articles. Results At the time of diagnosis, 58–85% of patients have hypertension, 32–41% are obese, 20–47% have diabetes mellitus, 50–81% have major depression, 31–50% have osteoporosis, and 38–71% have dyslipidemia. Remission rates following transsphenoidal surgery (TSS) are high when performed by expert pituitary surgeons (rates of 65–90%), but the potential for relapse remains (rates of 5–36%). Although some complications can be partially reversed, time to reversal can take years. The HRQoL of patients with CD also remains severely compromised after remission. Conclusions These findings highlight the significant burden associated with CD. As current treatment options may not fully reverse the burden of chronic hypercortisolism, there is a need for both improved diagnostic tools to reduce the time to diagnosis and effective therapy, particularly a targeted medical therapy. Cushing’s disease (CD) is a rare condition caused by a pituitary adenoma that secretes excess ACTH (1), which promotes excess cortisol production from the adrenal glands. Excess cortisol induces a clinical phenotype that harbors all components of the metabolic syndrome, such as central obesity, diabetes mellitus, dyslipidemia, and hypertension, as well as muscle weakness, hirsutism, increased bruisability, psychological dysfunction, and osteoporosis (1, 2, 3, 4, 5, 6, 7, 8, 9, 10, 11). Different criteria for defining the remission of hypercortisolism have been proposed, ranging from the occurrence of definitive or transient postoperative hypocortisolemia to the adequate suppression of cortisol after dexamethasone administration. According to a recent consensus statement (23), persistent postoperative morning serum cortisol levels of <2 μg/dl (∼50 nmol/l) are associated with remission and a low recurrence rate of ∼10% at 10 years. Persistent serum cortisol levels above 5 μg/dl (∼140 nmol/l) for up to 6 weeks following surgery require further evaluation. When serum cortisol levels are between 2 and 5 μg/dl, the patient can be considered in remission and can be observed without additional treatment for CD. A subset of patients can even develop complete adrenal insufficiency (serum cortisol levels below 2 μg/dl (∼50 nmol/l)) up to 12 weeks postsurgery (24, 25). Therefore, repeated evaluation in the early postoperative period is recommended. However, long-term follow-up is necessary for all patients because no single cortisol cutoff value excludes those who later experience disease recurrence, and up to 25% of patients develop a recurrent adenoma within 10 years after surgery (26, 27, 28). Although epidemiologic data on CD are limited, several population-based studies indicate an incidence of 1.2–2.4 per million (14, 19) and the prevalence of diagnosed cases to be ∼39 per million population (14). Lindholm et al. (19) used the case definition as either the presence of a corticotroph adenoma or remission after neurosurgery, which yielded an estimated incidence rate of 1.2–1.7 per million per year. Etxabe & Vazquez (14) reported an incidence of 2.4 per million in Vizcaya, Spain. A large-scale retrospective survey carried out in New Zealand by Bolland et al. 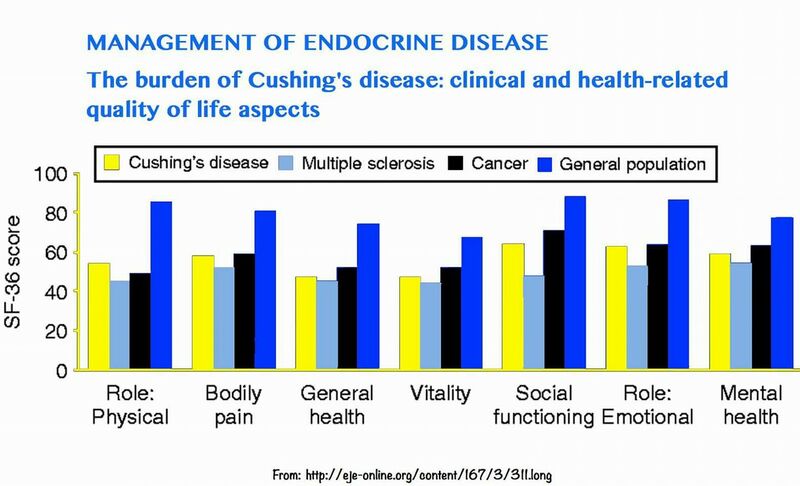 (29) found the approximate prevalence of all forms of Cushing’s syndrome (CS) (the majority of these cases were of pituitary origin) to be 79 per million and the incidence to be 1.8 per million per year. Differences in epidemiologic estimates may be attributable to varying case definitions (for instance, the study by Lindholm excluded cases in which the adenoma could not be localized or those that could not achieve remission from surgery), geographical differences, and temporal effects. The prevalence of CD may be underestimated due to unrecognized patients with mild symptoms and patients with a cyclic form of CD (30). Data on the time from onset of symptoms to diagnosis are also limited. In a prospective study by Flitsch et al. (31) of 48 patients with pituitary adenomas, including 19 who had ACTH-secreting adenomas causing CD, the reported time from onset of symptoms to diagnosis was 4.3 years. A study by Martinez Ruiz et al. (32), which was based on only four pediatric CD patients, reported the time between onset of symptoms and diagnosis as ranging from 2.5 to 5 years. Etxabe & Vazquez (14) estimated that the average time from onset of clinical symptoms to diagnosis in 49 CD patients was 45.8±2.7 months (6–144 months), thus 3.8 years. This is corroborated by the findings from a Belgian cross-sectional study on pituitary adenomas including CD, which estimated that patients experienced symptoms for an average of 45 months before diagnosis (33). However, the reliability and generalizability of these data are limited by small sample sizes and the retrospective nature of the studies. Indeed, the New Zealand data from Bolland et al. (29) report that on presentation, patients experienced symptoms for a median of 2.0 years (but ranging up to 20 years) before diagnosis. On the basis of data from the prospective European Registry on Cushing’s syndrome (ERCUSYN) (total number of patients=481, of whom 66% of patients had CD), median delay in diagnosis was 2 years (34).